When the weather gets like this—warm but not hot, sunny but not humid—I think about dashing out to small towns in the country and looking for farmer’s markets. I think about driving around rustic roads with the windows down and the music up. I think about jarred honey and vegetables with dirt still on them. In the Midwest, I have a good idea how to run out and find those places. Out here, I’ve only done it once, but to great success. Last autumn, the wife and I spent a weekend perusing old houses and buying fresh food in Washington, Georgia, and I’m pretty sure we’ll be driving back this spring to do it again. (See what I wrote back then.) It’s a good distance—away but not far—and a pretty drive, depending on how you do it. When we were out there last fall, we decided to spring for a night in a local B&B, which I’ve actually never done before in the States. (I think of B&Bs as Something You Do In Europe and New England.) My advice? Do it. Go forth and spend even just one night in a small town this spring. 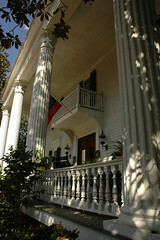 The B&B we chose was the Washington Plantation (pictured here), and we will absolutely go again. Just having the nice weather here has me thinking about it. The place is charming, but both big and cozy. You get rooms with fireplaces, but also cable, for the best of both worlds. Plus, it’s got a three-legged cat, which is always good. I don’t have a fireplace or cable at my house, so that’s almost reason enough to seek out a night away right there. But, of course, a B&B is half bed and half breakfast. Our bedroom was a claw-foot-tub and candies-on-the-pillows kind of place, good for the history buff in me, but good also for the guy who wants to sit around and watch a Dirty Jobs marathon for two hours. Breakfast, I recall, was awfully good, with fresh fruit and French toast, but aside from the grits (terrific, but I’m neither Southern nor a purist, so my opinion may not be worth much), what I really remember is the conversation. In my opinion, the hidden reason to stay at a B&B—and what makes it a trip in its own right—is the chance to chat with new people over breakfast. Every time I’ve done it, in the UK or the US, I’ve thought “it’s going to be awkward,” but it never is for long. At the Washington Plantation we talked politics with strangers and it wasn’t tense or vitriolic or fake. It was pleasant, thoughtful, reorienting. It was an exchange of ideas, like you read about. Even as somebody addicted to the Internet for it’s supposed ability to facilitate communication, I pine for happy conversations with strangers. You know, in person. It said a lot about the place, to me, that it was the pinnacle of a long search for the perfect B&B-worthy home. The funny and welcoming Yankee couple that runs the Washington Plantation, Tom and Barb, drove up and down the old Colonies looking for a spot to live out the dream of running a B&B, and they landed here. It’s easy to see why. The house seems built for slowing down, for sipping at Saturdays, for breathing deep, for sweet tea and sunshine. By the end of breakfast, and maybe some kind of crazy-delicious sausage grits I can’t forget, you’ll probably start thinking about moving outside the Perimeter and opening a B&B, too. Of course, you won’t go through with it. But that’s the point, right? We don’t have to. We can go and live inside somebody else’s dream house for a weekend, drink wine on a wraparound porch, chase a three-legged cat, and browse the local real estate, without giving up our lives ITP. We can get away, and come back. Good deal. Next week, why Birmingham, Alabama’s Sloss Furnaces are a great photographer’s daytrip. We saved $60 on our stay at the Washington Plantation by paying with gift certificates Costco sells at a discount. Just to be clear, the certificate did not discount our rate, but Costco sells them for less than they are worth. I’m told they’ve had an influx of reservations since your write up.